Suzanne Grant smiles at the towering tulip tree while she can. “Just the other day I observed five eagles flying over it,” the music teacher says on a balmy Tuesday of the tree rooted less than 50 yards from her Queen Anne home and three blocks from David Rodgers Park. 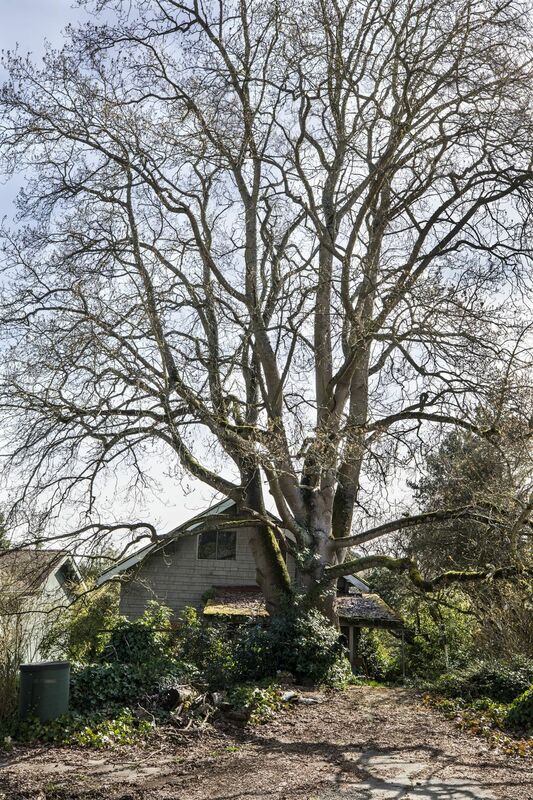 Nearly 90 feet tall, with a diameter of 44 inches that classifies it as “exceptional” by city code, the deciduous tree has served the neighborhood as a contemplative counterbalance to the ever-devouring urbanism of Seattle. Grant has spent the last year trying to make sure the natural landmark isn’t also consumed as new houses go up. 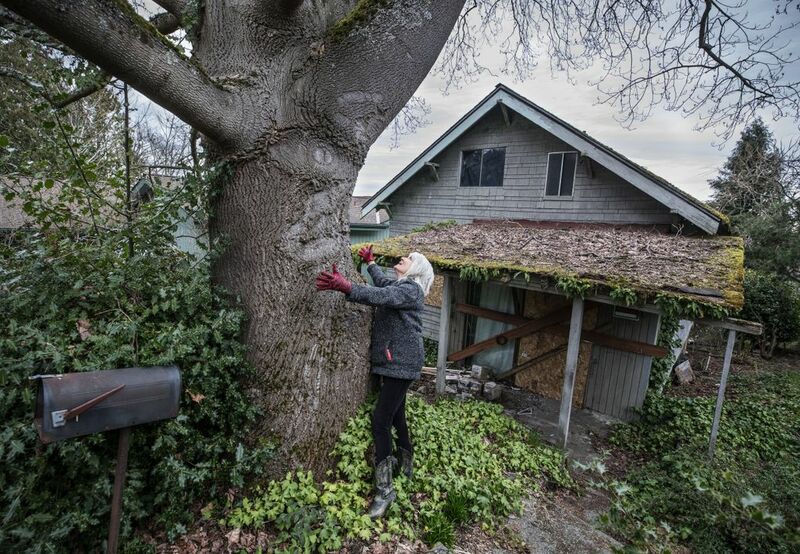 More than 80 years old, it is set for a developer’s saw this summer unless a city hearing examiner sides with her and dozens of neighbors attempting to preserve their local tree canopy. This neighborhood conundrum highlights a larger one playing out across the city and its swiftly shifting topography: Can a swelling population co-exist alongside keeping the Emerald City green? As the city referees about a dozen such battles a year, according to the Department of Construction & Inspections, that question has gotten more pointed year after year since 2009, the last time the city updated its tree ordinance. Between mayoral decrees, nonbinding resolutions and stalled legislation, the ensuing decade has brought plenty of faded hopes for Seattle tree advocates seeking new mandated protections for urban greenery. The city’s most recent effort at tree-protection reform, Trees for All, spearheaded by departing City Councilmember Rob Johnson, was drafted but never introduced to the full council after tree advocates complained it needed more protection for exceptional trees. “Putting in new buildings and protecting trees is incompatible,” said arborist Michael Oxman, about his frustration with the lack of an updated ordinance. Oxman, who is also a board member of the Seattle Green Spaces Coalition, says Seattle’s current ordinance is laxly enforced and allows developers too many loopholes to avoid preserving exceptional trees. In his more than 40 years as an arborist, Oxman says, he has been aware of measures developers have taken to get around saving a tree: mis-measuring a tree’s diameter, failing to note the presence of seven other trees with contiguous canopy on a property (making all exceptional), and arbitrarily declaring a tree “hazardous” even though it poses no risk. 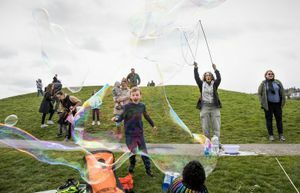 “There’s a number of tree advocates who want stronger protections and I want to work for that, but it’s likely they won’t get everything they want,” said Councilmember Mike O’Brien, about the balancing act between varied interests. As classified by city code, a tree is designated exceptional by virtue of its size, unique historical, ecological or aesthetic value that constitutes an important community resource. The city’s Department of Planning and Development lists diameter measurements that a particular tree species must meet to qualify for the designation. For residential real estate, city code strictly states that an exceptional tree must be preserved unless deemed hazardous to the surrounding community. However, the code grants developers more flexibility in removing such a tree if it prevents them from maximizing a lot’s “development potential” – meaning it limits how much of a property can be built on. That’s the crux of the argument between Suzanne Grant’s group of Queen Anne neighbors and developer Alex Mason, of MGT builders. Mason, who owns the land containing the exceptional tree and the 104-year-old vacant house adjacent to it, plans to replace both with five residential units, three town homes and two row houses, that he classified as “middle-class housing” in a required environmental checklist. Removal of the tree, and subsequent planting of replacement vegetation per city mandate, is necessary for Mason to maximize the lot’s development potential or floor area ratio according to a land-use application filed with the city’s Department of Constructions & Inspections. Not so, says Grant and other neighbors who have filed appeals, 12 in all, to get the city to halt their beloved tree’s removal. “You can’t deny a developer their right to make money. But I’d like him to consider other plans,” she says. Through a representative, Mason declined comment during the appeal process. Those plans have primarily been drawn by David Moehring, a Magnolia-based architect who first heard about the fight over the tulip tree via an online city bulletin. He soon volunteered his services to Grant and company, creating five different renderings that would allow Mason his floor area ratio and the tree to live, albeit with fewer parking spaces. “A developer can do what they want with their property, but they can choose creative ways, too, when it comes to preservation,” says Moehring. One of Moehring’s drawings was presented to Mason and a city representative at a public meeting over removing the tree held at the Queen Anne Community Center last May. But he says little consideration was given to it by the developer or city. Residents at the meeting also took exception with the three-story development’s impact on storm water runoff, and the stability of a slope that part of the new development will rest on. Peter Brest, a neighborhood resident who also attended the meeting, says that middle ground between the sides should be easier to find. He and Grant agree the city is trending toward sacrificing too many of its green spaces for bland “box-like” dwellings. They don’t wish to see the city’s canopy cover, the percent of a city covered by trees, decrease much from its current 28 percent, joining its West Coast kin, San Francisco (13.7 percent) and Portland (23 percent) as have less than a fourth of its topography shaded in green. That effort received some welcome news last week, as the City Council passed a resolution shepherded by council members Johnson and Mike O’Brien as part of the Mandatory Housing Affordability legislation expressing Seattle’s commitment to tree preservation and bumping its aspirational canopy goal to 33 percent. It also committed the city to protecting exceptional trees. “It’s really tricky to regulate our way into getting private individuals to be stewards of trees. We really want to cultivate a culture of stewardship and preservation in the Seattle community. So everyone feels a responsibility to do it,” says O’Brien, who adds the council plans to introduce new tree-protection legislation this summer. But as Grant awaits a date to have her appeal heard in front of a hearing examiner, she considers the city’s pace too cavalier. She says Seattle isn’t enforcing its own codes in only permitting developers to remove exceptional trees as a last resort.